The more I researched about minerals, nutrients, and the proper alkaline diet the angrier I became as a result. It seems the big farming corporations have been genetically engineering our foods for about 60 years in the name of higher corporate profits and the almighty dollar. Please bear with me as I explain what has happened and the risks we are all taking every day. This is not meant to be negative since there is a solution to this problem, but it is to make you aware of what you are eating every day. Armed with this knowledge, you can make the choices you need to make to have good health for you and your family. Your body is made up of individual cells that have their own individual environment and these individual cells come together to form organs. These organs network and come together to make up your body. Now understand that each individual cell lives in some type of environment. If this environment becomes altered by an excess of something that cell doesn't want or need, or if there is a deficiency of something that that cell needs, then you are going to end up with problems and the cells will get sick. Think about the environment on a much larger scale, such as what is found all through out the planet and nature. In nature mammals breathe oxygen, which is produced by plants, and plants breath carbon dioxide, which is produced by mammals. Nature finds balance and all things are interrelated forming the whole of the planet which is a living thing itself. It is this kind of relationship that is critical to understanding what has happened. Lets take a look at water that comes from the clouds and hits the ground. This process releases minerals, nutrients and enzymes from the soil to be used by plants. We humans and other animals eat these plants and gain nutritional benefits from them. Excess water evaporates and returns to form clouds and the cycle happens all over again. As we all eliminate these nutrients, vitamins, and enzymes; they go back into the earth and cycle back around again. So we are a part of this environment and share all these things with our environment. Really quite simple isn't it. Our bodies will also store up a mineral, enzyme, and nutrients in a reserve account. At the same time there is a waste-processing center that uses some of these nutrients, minerals, and enzymes to eliminate the cells waste. So the cells must be able to have the proper amount and kinds of nutrients and they have to be able to get rid of wastes to be healthy. Now if you go to different areas and cultures in the world you will find people that traditionally live to be 100 years old where this natural environment has not been disturbed. Unfortunately in the US the life cycle has been drastically altered. 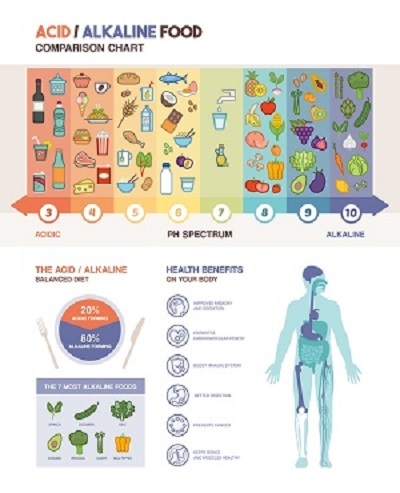 What Happened to Alkaline foods? About 50 years or so ago the food industry wanted to make more money so they got together with the scientists and said hey, we need to grow more crops so we can make more money, can you help us? So the scientists went to work and decided that they lost a lot of crops to weeds. These weeds were competing for water, nutrients, minerals and enzymes with the plants they were growing for foods. So, they introduced herbicides to kill the weeds. Then the scientists said you have a lot of bugs and insects eating these foods. So they introduced pesticides to kill the bugs that were eating the plants and foods. Then they realized that the foods had a lot of fungi that were destroying the crops. So they introduced fungicides and sprayed the crops. Now at this point the food companies where growing more crops and making a lot more money, but look what happened next. They had too much food stacking up on the grocery store shelves driving down the prices, because it was also rotting, since people could not consume it fast enough. So they went back to the scientists and asked them if they could prevent this food from rotting to fast. So now we get back to the Enzyme Cycle. When an apple is pulled from a tree it can no longer get nutrients, vitamins, minerals, and enzymes from the tree, and it cannot eliminate its wastes from its cells. It has become a fully self-contained living thing even though it has been removed from the tree. It will now through the use of enzymes (nothing happens in the body without them) start to eat itself to stay alive; this causes it to rot as the plant runs out of internal nutrients. Think about this as it relates to your body for a minute. So back to the scientists that discovered that they could introduce enzyme inhibitors by heat, radiation, and other chemical therapies. These processes come in and kill the enzymes within the food so the food will not self-digest. Now you have an extended shelf life for these foods, but these foods are for all purposes nutritionally dead. They offer very little nutritional value for the human body. Then the food companies found that bacteria was eating some of this food and causing it to rot. So back to the scientists who decided ok, we will inject embalming fluid into these foods and call it preservatives! So now we have these foods that bugs, fungi, and bacteria won't eat because it is dead and has been treated with chemicals. But, whom do you think will eat it? Humans! Is it any wonder we rank #38 in the world for health care and our life expectancy is 28th. The US is also ranked #1 for the incidence of degenerative diseases. "Basically, you die earlier and spend more time disabled if you're an American rather than a member of most other advanced countries." Now these chemicals are known as xenobiotics that work by going into the living cell of the plant and destroy the reproductive organs and systems of that cell, and we eat this stuff. Presently, the food industry are adding animal dna to plants. Performing gene splicing and cross breading. Introducing growth chemicals directly into the cells of the plant to get them to grow bigger, etc. Is it any wonder that the rest of the world won't buy our genetically altered produce any more? Think about all this for a minute as it applies to your health and acidosis. If we are eating enzymatically dead foods that are loaded with chemicals and are nutritionally dead, as these toxins accumulate in the body, wouldn't it most definitely run the body down and weaken your immune system. 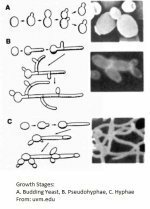 You bet it would and that weakened immune system would allow yeast to get out of control.